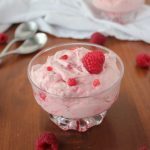 This light, airy Raspberry Delight is a 4-ingredients, 5-minute quick and creamy fruit salad (or dessert). Perfect for your next summer potluck. 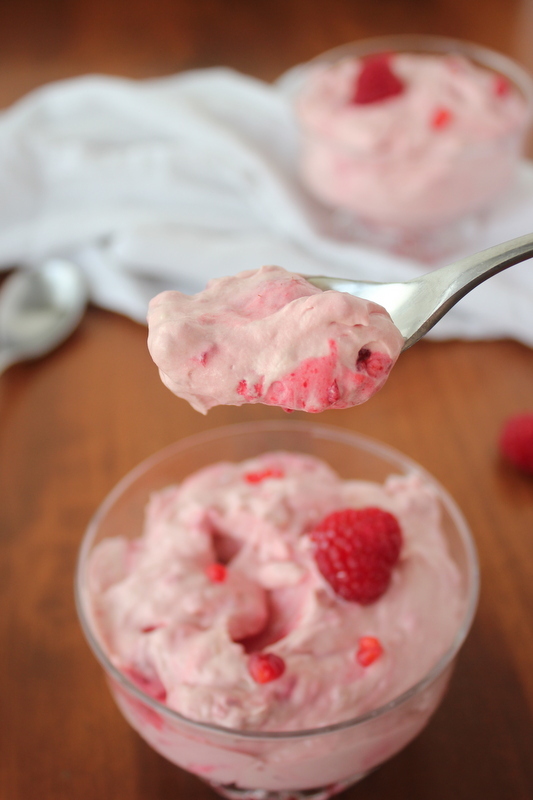 This super easy whipped topping raspberry delight is so good. It’s the perfect side dish or even dessert for those busy nights. It’s a hit at any potluck too. 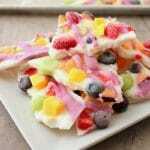 This quick and easy recipe is a whipped topping-based fruit salad that can totally pass as a light and airy dessert. 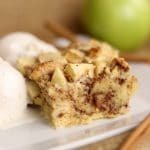 It’s fabulous by itself but can also be made into a no-bake pie, fruit and cookie dip or even frozen and enjoyed like a pudding popsicle. I recently met up with Amy from My Recipe Treasures. If you haven’t checked it out, DO! 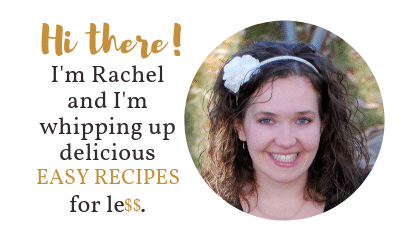 Amy is a beautiful person inside and out sharing tons of fabulous family-friendly recipes. This Raspberry Delight filled with whipped topping. That makes this a fantastic light salad. 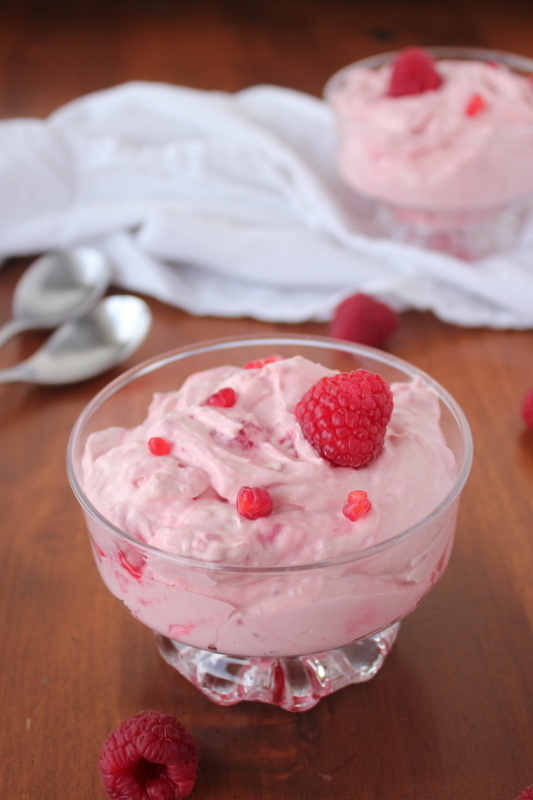 The raspberries are so refreshing. 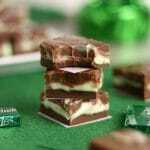 Another reason why I love this recipe is for the versatility factor. You can literally make this quick creamy fruit salad or change it up with a minor tweak to get something totally different. Pour this Raspberry Delight recipe into a store-bought or homemade graham cracker pie crust and you have yourself a yummy raspberry delight pie. Freeze it in popsicle molds to enjoy on a hot summer afternoon. Indulge yourself by using it as a fruit or nilla wafer cookie dip. Seriously awesome versatility with this one! 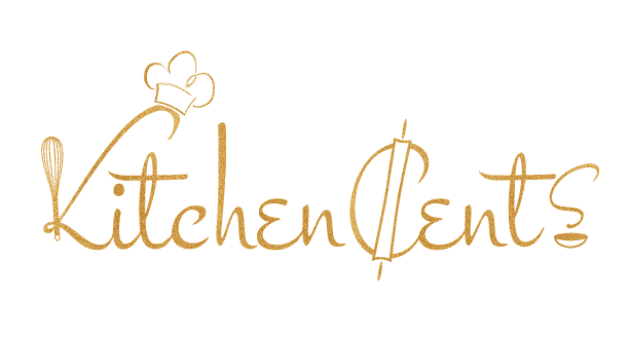 One more shoutout to Amy over at My Recipe Treasures for hanging out, shooting this video and letting me share this great recipe here at Kitchen Cents. Head on over to see what she’s cooking up, it’ll be worth the trip. What’s your go-to potluck salad? In a medium size bowl, mix whipped topping, yogurt and pudding together. Sprinkle raspberries on top as garnish, optional. 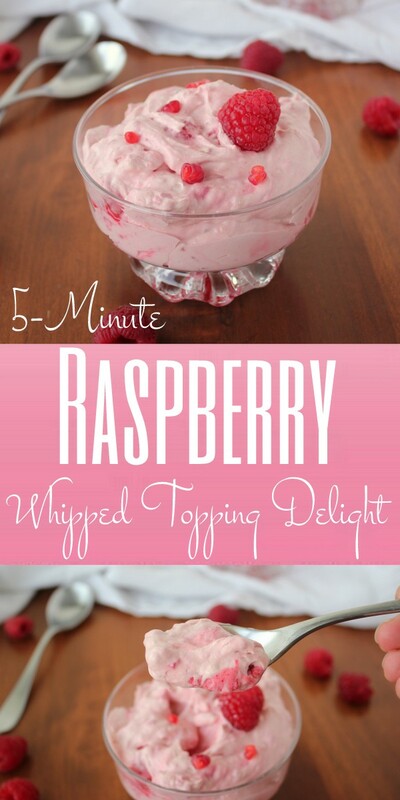 Not a fan of raspberries? Switch them out for your favorite berries and yogurt to match. Fresh berries can be used but the juice from frozen-thawed berries (because of the juice) add flavor to the cream that fresh will lack. The juice of the thawed fruit will also color the salad. What else can you make with this recipe? Raspberry Delight Pie: use this recipe. Pour into graham cracker pie crust. Chill to set. Raspberry Delight fruit dip: dip fresh fruit and nilla wafer cookies Frozen Raspberry Delight pops: freeze in popsicle molds. Thanks, Amy and thank you for coming over. Sometimes it’s nice to have another adult to talk to especially when they do the same thing you do. 😉 Don’t ask me how many times I’ve made this or a version of this salad since we got together… let’s just say it’s a little embarrassing. Although everyone who’s tried it have raved about it!